Arnie out Jiménez in. Hope this is the week wolves turn it around. Good luck all. Hey guys! Green arrows everywhere finally! Racked up 23 points more than the average that gave me around 100k overall green arrow. Before the gameweek was over though I had 3 injured players- Mane, Martial and Arnautovic. This forces me to make 2 transfers with a 4 point hit. I went for Aubameyang instead of Arnautovic and Snodgrass instead of Mane. Mane was going to go either way as he is too inconsistent for his price tag. 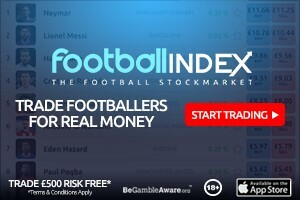 Aubameyang even if he gets benched tomorrow is a great addition and Snodgrass with a mere 0.4% ownership and a good fixture is a good gamble I am willing to take. The lineup is pretty straightforward actually. The only question is starting Jimenez instead of Martial as I fear he wont start and make a sub Appearence for 20ish minutes. Mourinho said the injury wasn’t anything special so if he starts I think he will deliver so I am leaving him in. As for the captain choice. I think Kane wont play the full 90 min as he has Barcelona mid- week and Auba might get benched but since Emery gives him minutes even when benched and he has scored 2 double digits on GWs 8 & 9 off the bench I am going with him. Another bad week. Unlike last year where I spiralled downward in December due to injuries but did not take hits to be conservative, this year I am trying to buy my way out of a slump. 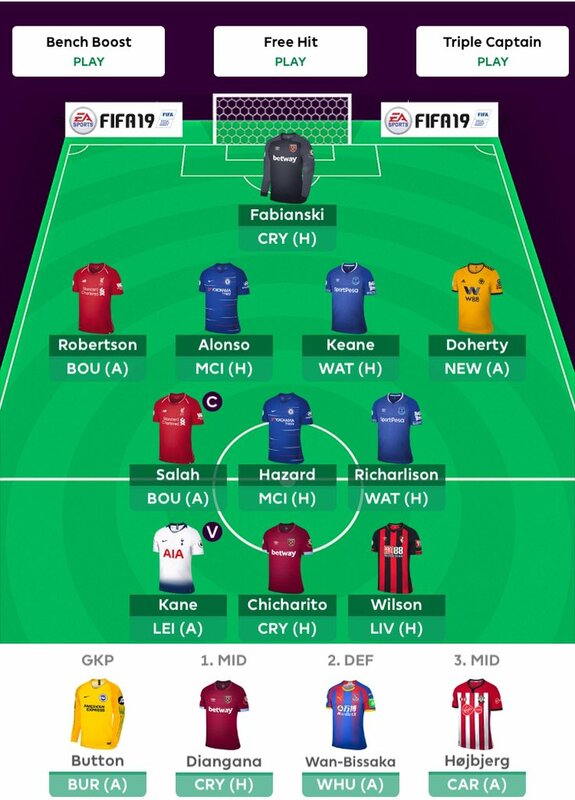 The team I have now is pretty close to what I envisioned three weeks ago but restricted myself to -4 the last two weeks. Kane, Sterling and TAA in—Arnautovic, Salah, Alonso out. Aubameyang captain. At some point I think things will turn. If not, then so be it. GW15 was slightly better than average with 57 points (-4), although most points came from captain Kane and Fabianski, which both are highly owned in the top part of the ranks. Moves this week are Salah and Arnautovic to Sterling and Lacazette. Sad to remove Salah, but someone had to go. Hopefully he won’t explode before I manage to bring him back in few weeks time. Lacazette for captain this week. 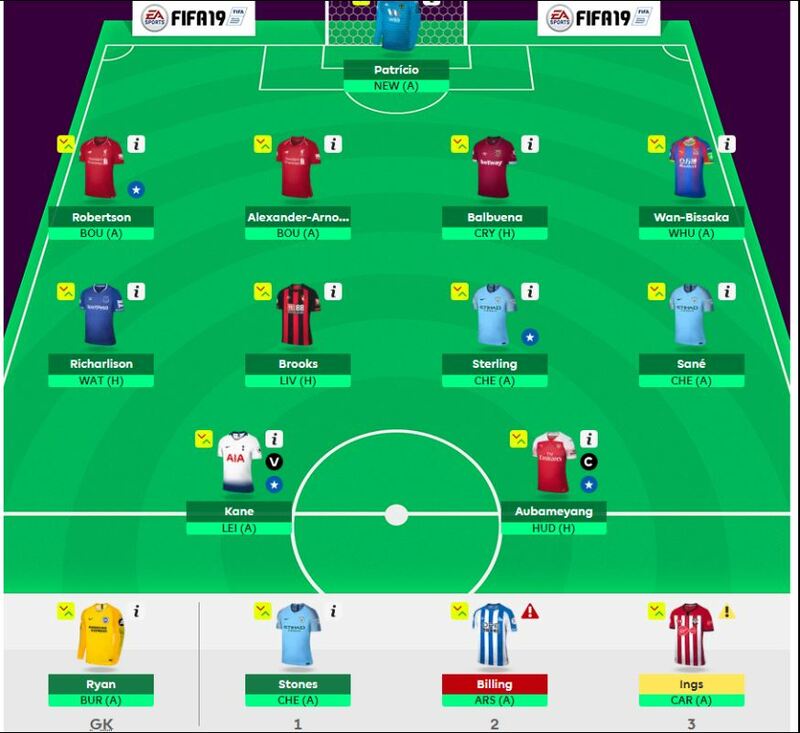 Good luck for GW16 Geekers ! 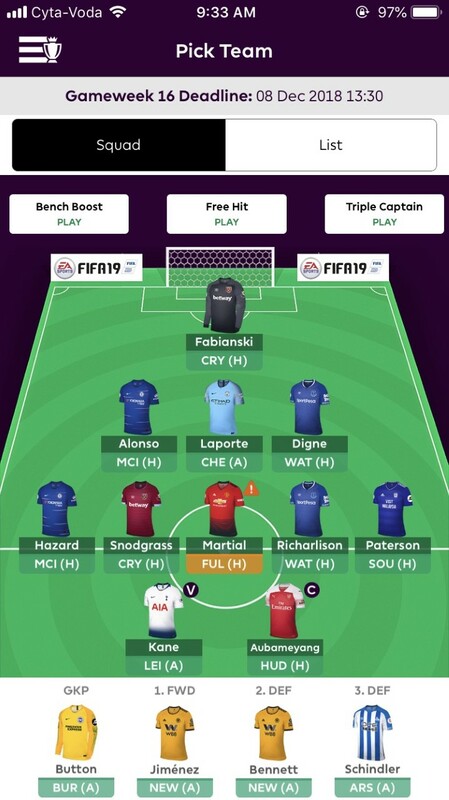 The updates on Aguero’s and Arnie’s injuries made this an easy decision, even though there are some other issues in the team (Chelsea players out and Liverpool in). Those will just have to be sorted out later as I foresee some more teamsheet surprises this weekend, and I’m not ready to take a -8 hit either. Let’s hope Hazard somehow manages to work his magic against the second best defense in the league. 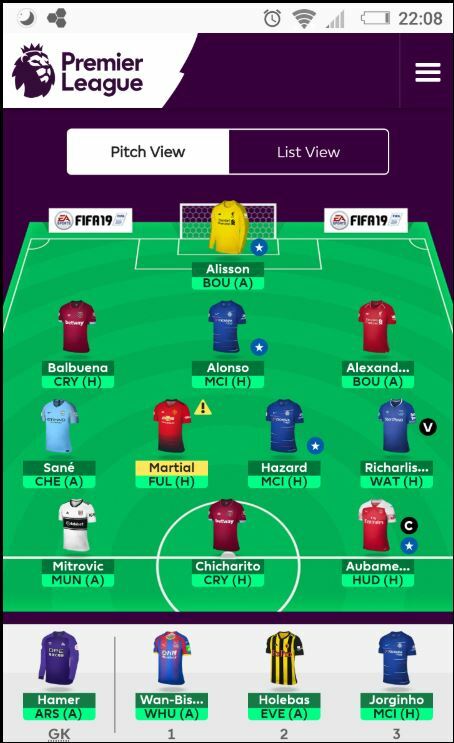 Aubameyang is the bandwagon recruit, while I have been impressed with Chicharito in the last gameweeks and think Pellegrini will pick him for his heading abilities (Perez will then be the super sub, or maybe second striker). 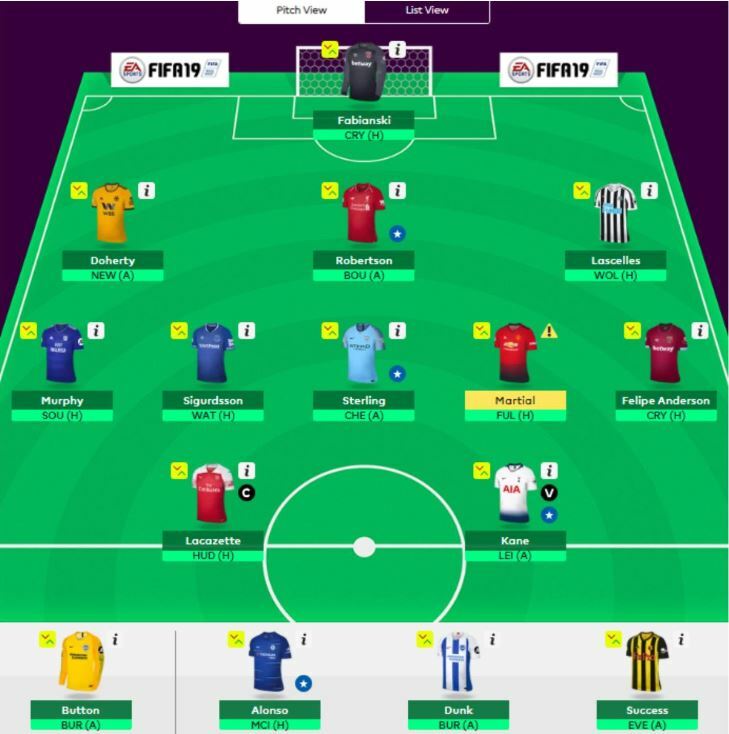 Captain will be Aubameyang, vice will be richarlison due to his gametime safety. There is 8 – 10 goals for this Arsenal side in these next 3 games. Nobody was going to miss that gravy train Ming.